Stanley Birdbaum couldn't be more excited. He has rolled and wrapped and dyed his hair. He has dipped it and sprayed it and made it, well, perfect. He is ready to celebrate Crazy Hair Day at school. 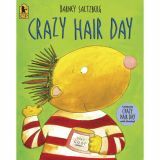 But when Stanley saunters up to the classroom, he learns, to his horror, that Crazy Hair Day is . . . next week. To make matters worse, today is School Picture Day, and everyone is expected to line up for the class photo! What's Stanley to do? 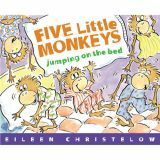 Curious George is a good little monkey, and always very curious. Now George is curious about numbers. Counting from 1 to 10 is easy, but can he count all the way to 100? George has picked the perfect day to try. It's his town's 100th birthday today and everyone is coming out to celebrate! 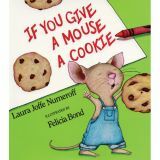 In this large format, paper-over-board book each page features familiar objects for children to count. 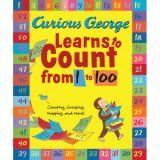 A perfect book for celebrating counting, numbers and the 100th day of school. 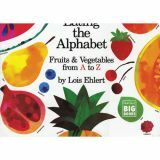 In brilliant watercolor collages, Lois Ehlert introduces young readers to a wide variety of fruits and vegetables from A to Z. Clearly labeled and easy to identify, the favorites in the collection include apples, bananas, potatoes, and tomatoes--as well as some less common edibles. 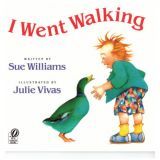 These catchy stanzas frolic through the Australian author Sue Williams's simple, funny read-aloud picture book that tracks a crazy-haired boy's stroll through the countryside. The boy sees a black cat, then a brown horse, then a red cow, and so on, and before he knows it, he's being trailed by the entire menagerie! The Australian illustrator Julie Vivas brings the parade to life in lovely, lively watercolors—when the pink pig looks at the boy, for example, the boy sprays off his muddy body with a hose. Big type, repetition, friendly art, clean design—and the visual guessing game created by introducing each animal only partially at first—make this beloved tale a winner at story time. 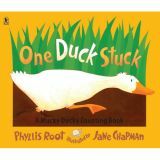 One duck is stuck in the muck. Can two fish, tails going swish, help? What about three moose, munching on spruce? Will four crickets, chirping in the thickets, manage to pull the unlucky duck out of the muck? Bright, spirited illustrations by Jane Chapman enhance this one-of-a-kind counting tale by Phyllis Root — a feast of sounds and numbers sure to have listeners scrambling to join in the slippery, sloppy fun. 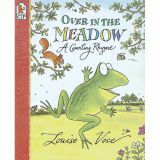 Candlewick has selected OVER IN THE MEADOW to be a BIG Book because it exemplifies the qualities—rhythmic texts, repetitive words, dynamic illustrations, and engaging story lines—that make large-format books so useful in helping children to read and learn. 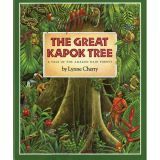 This educational and enjoyable book helps children understand how to plant bulbs, seeds, and seedlings, and nurture their growth. 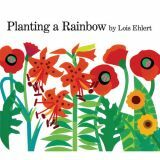 Lois Ehlert's bold collage illustrations include six pages of staggered width, presenting all the flowers of each color of the rainbow. The classic tale of the old couple, with no children of their own, who bake a gingerbread boy to keep them company. Just as the little old woman is about to take him from the oven, he slips away and runs out the door past a cow, a horse, a group of threshers, mowers, etc. All follow in hot pursuit until the gingerbread boy meets up with a wily fox, and "at last and at last he went the way of every single gingerbread boy that ever came out of an oven . . . He was all gone!" A wonderfully frenetic cross-country chase is depicted in Galdone's broadly humorous color wash drawings. 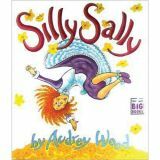 Of the eight editions of this well-known story now in print, this hilarious version is the most delectable." 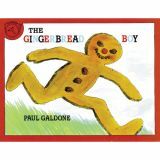 School Library Journal, starred "Galdone has already proven many times over that he is perfectly at home with those traditional nursery tales that are still preschoolers' favorites, and his expressive, unassuming style just right for their very young audience. . . . Children will follow along breathlessly . . . right up to that last snip snap snip when the Gingerbread Boy goes "the way of every single gingerbread boy that ever came out of an oven.